Your decision to undertake a career in real estate merits very careful consideration. Before you register for this course, you are required to read the Real Estate Council of British Columbia's Real Estate as a Career information and Step By Step Guide and Budget, and How to Satisfy the English Language Proficiency Requirement. The Strata Management Licensing Course is administered on behalf of the Real Estate Council of British Columbia (RECBC) and provides the licensing education requirements for those who wish to become licensed strata managers in British Columbia. This award winning course was recently redeveloped and received the Education Award of Excellence in the Pre-Licensing Education category from the Association of Real Estate License Law Officials (ARELLO®), an international organization of regulatory agencies. The course focuses on public protection, professional readiness and emerging issues in Strata Management and includes components that will help students apply their knowledge in practice. For detailed course content information, please view the Table of Contents and Course Regulations. This blended learning course allows you to register at any time. While the course is flexible in order to meet the needs of busy adult learners, it provides just enough structure to ensure high quality learning (for example, in order to provide for a minimum level of familiarity with the curriculum and for a reasonable expectation of success on the final examination, assignments may be submitted on a pace that is no greater than 2 assignments per week beginning on the Course Registration Date). You must complete all course assignments within one year of registration in the course and also pass a final examination. Regularly scheduled exams take place at various times throughout the year throughout the province (exams must be written in Canada) and your first written examination registration is included with the course tuition fee. You may also choose to take your exam at the computerized exam centre (CEC) at UBC for an additional fee. Language proficiency is an essential skill for real estate practitioners. A real estate licensee’s ability to communicate verbally and in writing with consumers and other licensees is critical for the delivery of competent services. Many British Columbians speak languages other than English as their first language, and may choose to work with a real estate licensee with whom they can communicate in the language of their choice. However, real estate contracts and standard forms in British Columbia are in English. While there are no pre-requisites to register in the licensing course, the ELPR must be satisfied before you can register for an exam and if licensing is your intention we strongly recommend that you consider satisfying the ELPR prior to course registration. has been licensed for real estate services in another Canadian jurisdiction with English language standards and have satisfied that jurisdiction's English language requirements. For more information on the ELPR, view How to Satisfy the English Language Proficiency Requirement. Completing the Strata Management Licensing Course satisfies the licensing educational qualification in British Columbia for a licence to provide strata management services. In order to open your own strata management company, you will be required to either satisfy the requirements for a brokerage licence, or hire a managing broker for your company. For information on these requirements, contact the Real Estate Council of British Columbia at (604) 683-9664 or toll-free at 1-877-683-9664. 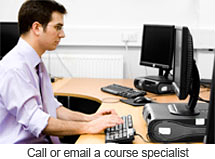 Tutorial assistance from our course specialists, through a toll-free number and email. Online course resources, containing course updates, study materials, schedules, and tutorial information. You are encouraged to take advantage of the Tutorial Assistance provided with your course rather than spending additional money on external services. It is important to note that the Real Estate Division has no ties with tutorial classes provided by other members or organizations of the real estate industry and does not monitor or check the services they provide. The Real Estate Division cannot be responsible for any information provided by these individuals or companies. External tutorial companies regularly make false claims, such as "only 30% of students pass the exam" or "we'll guarantee that you will pass the exam", so that you will spend your money with them. Remember, there are no guarantees and the Real Estate Division works with all students to provide every opportunity for success. The Real Estate Division's goal is to ensure fair and consistent treatment of all students, including students with a disability, in accordance with their distinct needs and in a manner consistent with academic principles. UBC Centre for Accessibility works in partnership with the Real Estate Division and provides support on issues of accessibility for people with disabilities. Examination accommodations enable you to demonstrate your knowledge of the course materials in cases where a disability may impact your ability to access exams under standard conditions. Students who may have an on-going disability or medical condition that requires accommodation must contact UBC Centre for Accessibility by telephone: 604.822.5844 or email: accessibility@ubc.ca at least two months prior to the anticipated examination date. Processing times for examination accommodation will vary so we encourage students to discuss their needs with UBC Centre for Accessibility as soon as possible. How do I contact the Real Estate Division? Phone numbers, fax numbers, email addresses, etc. can be found at the Contact Us area of the website. When I phone the Real Estate Division about the licensing courses, should I talk to a specific person? The Real Estate Division is divided into several different groups and has staff who specialize in specific areas. While any Real Estate Division staff member you talk to will do their best to help you, certain staff members deal with specific enquiries. If you need help in one of the areas below, please ask for the appropriate staff person who can help you. help with course planning, exemptions, etc - ask to speak to the Admissions Officer or a Course Representative. If I am coming to the Real Estate Division, how do I get there and where do I park? Directions and parking information can be found at the How To Find Us area of the website. Which licensing course should I take? To determine which licensing course you should take, read the brief course descriptions on the Licensing Programs webpage. Follow the links for each individual course to find out more. Is there an English Language Proficiency Requirement for licensing courses? Yes, completion of the Canadian English Language Proficiency Index Program - General (CELPIP-G) test, or a recognized equivalent, is one of the requirements for licensing courses. For further information, please view the English Language Proficiency Requirement webpage. Does everyone have to satisfy the language proficiency requirement? Real Estate Trading Services, Rental Property Management, and Strata Management licensing course students must satisfy the English Language Proficiency Requirement (ELPR). What is the purpose of the English Language Proficiency Requirement (ELPR)? The purpose of the ELPR is to provide information about an individual student's competency in English. If I need to write the CELPIP-G test, where can I get information? Information on the CELPIP-G test can be found on CELPIP's website. If I am seeking exemption from the English Language Proficiency Requirement, where can I get information? Information on exemptions from the English Language Proficiency Requirement can be found on the English Language Proficiency Requirement webpage. If I am seeking exemption from the English Language Proficiency Requirement, where do I send my official transcripts? Official copies of transcripts from the educational institution can be sent directly to the Real Estate Division office. Do I need to complete assignments for the licensing courses? Depending on the course, students are required to submit and pass either multiple choice or multiple choice and written assignments in order to be eligible to register for the final exam. These assignments ensure that students are reviewing the course materials and provide feedback on their level of understanding. Why can I only submit 2 assignments per week in this course? Limiting the frequency of assignments to two assignments per week is a Real Estate Division Licensing Course regulation which is in place for the best interests of both students and the public. This regulation was arrived at after a great deal of consideration and after consultation with the Real Estate Council of British Columbia. A number of factors were taken into account, including the increased volume and complexity of information contained in the licensing courses and also our observations of student completion and success rates. This regulation is intended to provide not only for a minimum level of familiarity with the course materials, but also for a reasonable expectation of success on the course examination. Please see Course Regulation 2.02 (4) and (5) for more information. If I don't submit an assignment for a few weeks, what happens? Only 2 multiple choice assignments may be submitted in a particular week, regardless of how many assignments have been submitted in prior weeks. Written assignments, if applicable, may be submitted at any time before 12 months from the date a student registers for a course regardless of how many multiple choice assignments have been submitted in that week. Can I get an exemption from the 2 assignment per week regulation based on my experience, education and commitment to full time studies? There is no exemption from Course Regulation 2.02 (4). This regulation is intended to provide not only for a minimum level of familiarity with the course materials, but also for a reasonable expectation of success on the course examination. As educators our hope is, of course, that given the importance of a good educational basis for a career in real estate services, most students will wish to engage with the materials to a much greater extent than merely the minimum. What is the format of the final examination? The Strata Management Licensing Examination will be three hours in length and contain 100 questions in a multiple choice format, each worth one mark. All supplemental examinations will be two hours in length and contain 60 questions in a multiple choice format. Inter-provincial examinations will be two hours in length with 50 questions in multiple choice format. What is the passing grade on the examination? Seventy (70) percent is a passing grade. A passing grade sets the minimum level of performance needed to practice in a profession, as determined by the regulatory body. The passing grade needed must be high enough to protect the public but not so high as to unreasonably limit the number of those who wish to practice. I read that only about 26% of candidates who write the exam will pass it and the exam is used to limit the number of licensees/registrants in the business? Is this true? No, this is not true, although extremely low passing grades are sometimes made up and reported by tutorial outfits who are looking for your business. The pass rate for each sitting of the exam varies, however, the majority of students who write the exam will pass. The UBC Real Estate Division, the Real Estate Council of British Columbia and the Financial Institutions Commission of British Columbia do not try to limit the number of students who pass the exam - they are only concerned with the fact that those who do pass the exam have the prerequisite knowledge to be likely to not harm the public. If you do not see your question listed here, please contact us. The Strata Management Supplemental Course is available to those licensees who are currently licensed, eligible to be licensed, or who have written a full licensing exam within the last year and wish to become licensed to provide additional real estate services. The Course Schedule gives you an indication of the topics and lessons included. Students should confirm their eligibility for a supplemental course before registration. As well, depending on eligibility, some students may be required to satisfy the English Language Proficiency Requirement and/or write the full three hour exam. Tuition for the Supplemental Course is $775. In certain cases, course exemptions are available based on previous related experience or education. If you have attained the required level of education in the requisite knowledge areas through prior education or training, you may be eligible to apply to have some or all of the standard educational requirements for licensing waived. To make a request to have some or all of the licensing education requirements waived, you must submit the following information in writing to the Real Estate Council of British Columbia. - any other relevant information. Further details about course exemptions are set out in the Education & Licensing Guidelines provided by the Real Estate Council of British Columbia. NOTE: If you are currently licensed and wish to add a service to your licence, you are required to complete the Supplemental Course and Examination. Please visit the Supplemental tab for more information. The Challenge Package assists students who have received permission to challenge the examination. The Challenge Package includes the course materials (such as the course manual, student handbook, course workbook and answer guides), access to the Course Resources webpage and the central tutor support service. Tuition for the Challenge Package is $350. Individuals who have been provided with a written confirmation of a course exemption from the Real Estate Council of British Columbia. Please note that as an alternative to purchasing the Challenge Package, you can purchase some course materials individually from the Bookstore; however, the course workbook, answer guides, student handbook and access to the Course Resources webpage are only available with the Challenge Package. DO NOT download the challenge exam registration form if you are currently registered in the Strata Management Licensing Course. Visa, Mastercard, Certified Cheque, and Money Order only. Cash and personal cheques are not accepted. WHAT'S INCLUDED: Your tuition fee includes all of the appropriate course materials (course manual, workbook and student handbook - usually dispatched via courier within three to five business days of registration), access to tutorial services, and your first examination registration provided it is on a regularly scheduled examination date. Calculators are sold separately. Please note that tuition fees are subject to change and a minimum withdrawal reduction of $200 will apply once your registration has been processed. No refund of course fees will be available unless a withdrawal request is received by our office within one month of your registration date. All students must have access to a personal computer, a printer, and the Internet (including email) when taking any Real Estate Division course. You will find that a computer is an essential tool in submitting your assignments, viewing your assignment answer guides, and for creating effective study notes to help you prepare for your examination. As well, all Real Estate Division courses include online resources and if you do not have internet access or an email address, you will not be able to take advantage of these resources.